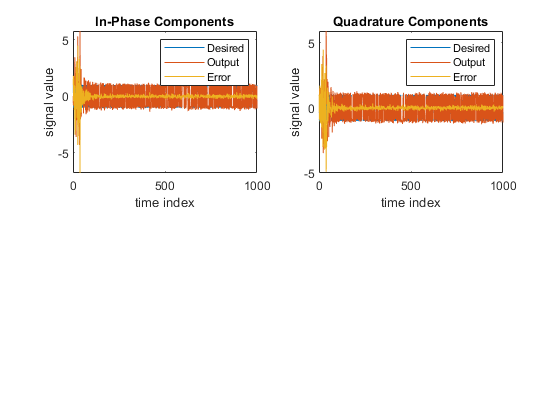 The dsp.AdaptiveLatticeFilter System object™ computes output, error, and coefficients using a lattice-based FIR adaptive filter. Create the dsp.AdaptiveLatticeFilter object and set its properties. alf = dsp.AdaptiveLatticeFilter returns a lattice-based FIR adaptive filter System object, alf. This System object computes the filtered output and the filter error for a given input and desired signal. alf = dsp.AdaptiveLatticeFilter(len) returns an AdaptiveLatticeFilter System object with the Length property set to len. alf = dsp.AdaptiveLatticeFilter(Name,Value) returns an AdaptiveLatticeFilter System object with each specified property set to the specified value. Enclose each property name in single quotes. Unspecified properties have default values. Specify the method used to calculate filter coefficients as one of 'Least-squares Lattice', 'QR-decomposition Least-squares Lattice', 'Gradient Adaptive Lattice'. The default value is 'Least-squares Lattice'. For algorithms used to implement these three different methods, refer to  . This property is nontunable. Specify the least-squares lattice forgetting factor as a scalar positive numeric value less than or equal to 1. Setting this value to 1 denotes infinite memory during adaptation. This property applies only if the Method property is set to 'Least-squares Lattice' or 'QR-decomposition Least-squares Lattice'. Specify the joint process step size of the gradient adaptive lattice filter as a positive numeric scalar less than or equal to 1. This property applies only if the Method property is set to 'Gradient Adaptive Lattice'. Specify an offset value for the denominator of the StepSize normalization term as a nonnegative numeric scalar. A nonzero offset helps avoid a divide-by-near-zero condition when the input signal amplitude is very small. Specify the reflection process step size of the gradient adaptive lattice filter as a scalar numeric value between 0 and 1, both inclusive. The default value is the StepSize property value. Use this property only if the Method property is set to 'Gradient Adaptive Lattice'. Specify the averaging factor as a positive numeric scalar less than 1. 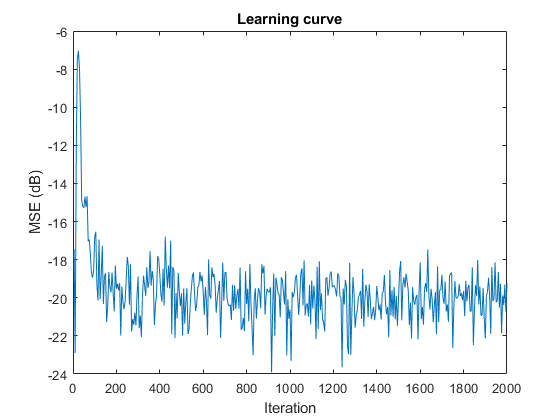 Use this property to compute the exponentially windowed forward and backward prediction error powers for the coefficient updates. The default is the value of 1 - StepSize. This property applies only if the Method property is set to'Gradient Adaptive Lattice. Specify the initial values for the prediction error vectors as a scalar positive numeric value. If the Method property is set to 'Least-squares Lattice' or 'QR-decomposition Least-squares Lattice', the default value is 1.0. If the Method property is set to 'Gradient Adaptive Lattice', the default value is 0.1. This property is applicable only if the Method property is set to 'Gradient Adaptive Lattice'. [y,err] = alf(x,d) filters the input x, using d as the desired signal, and returns the filtered output in y and the filter error in err. The System object estimates the filter weights needed to minimize the error between the output signal and the desired signal. You can access these coefficients by accessing the Coefficients property of the object. This can be done only after calling the object. For example, to access the optimized coefficients of the alf filter, call alf.Coefficients after you pass the input and desired signal to the object. The signal to be filtered by the adaptive lattice filter. The input, x, and the desired signal, d, must have the same size and data type. The input can be a variable-size signal. You can change the number of elements in the column vector even when the object is locked. The System object locks when you call the object. The adaptive lattice filter adapts its coefficients to minimize the error, err, and converge the input signal x to the desired signal d as closely as possible. The desired signal can be a variable-size signal. You can change the number of elements in the column vector even when the object is locked. The System object locks when you call the object. Difference between the output signal y and the desired signal d, returned as a scalar or a column vector. The objective of the adaptive lattice filter is to minimize this error. The object adapts its coefficients to converge towards optimal filter coefficients that produce an output signal that matches closely with the desired signal. To access the adaptive lattice filter coefficients, call alf.Coefficients after you pass the input and desired signal to the object algorithm. Create the QPSK signal and the noise, filter them to obtain the received signal, and delay the received signal to obtain the desired signal. Use the Adaptive Lattice Filter to compute the filtered output and the filter error for the input and desired signal. Plot the received and equalized signals’ scatter plots. Griffiths, Lloyd J. “A Continuously Adaptive Filter Implemented as a Lattice Structure”. Proceedings of IEEE Int. Conf. on Acoustics, Speech, and Signal Processing, Hartford, CT, pp. 683–686, 1977 . Haykin, S. Adaptive Filter Theory, 4th Ed. Upper Saddle River, NJ: Prentice Hall, 1996.